RTW – Eyes on Your Audio: RTW - ... a SSA? 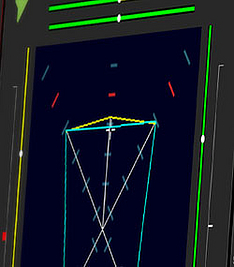 The Surround Sound Analyzer is a pioneering and unique visualisation tool showing the relevant technical and subjective parameters of surround signals in a fast and intuitive way. The RTW Surround Sound Analyzer, being well accepted across the whole industry now, is also licensed by US manufacturer Tektronix® to be used in the industry standard Waveform Monitors. The Surround Sound Analyzer displays a correctly-scaled graphical representation of the relative volumes in the surround sound field. The interaction of levels (volume, sound pressure level or loudness) and the correlation of all channels in the overall surround sound is displayed graphically, providing a very clear overview. The graphical display has been carefully designed so that the dynamic behaviour of all display elements corresponds to the subjective listening impression, showing the balance of the surround program intuitively and at a glance. The display in the Surround Sound Analyzer can be set to correspond to the volume or the reference sound pressure level by calibrating the instrument and your studio monitoring equipment accordingly. The axes of the 45° coordinate system use a dB volume level or dB-SPL scale and have a reference mark that is also displayed in the volume level and SPL displays in the peak program meter of the instrument. The balance between the Center channel and the L and R front channels is generally a critical parameter for surround programs. For this reason, the Center channel is shown with its own display elements showing volume differences between the Center channel and the L and R channels very clearly. Besides the signal level, also correlation and phantom source locations are of general interest in surround sound production. This is particularly important in relation to downmixes or possible sound faking erasements when generating a mono signal. The correlation of sL (LS) and sR (RS) surround channels is of particular importance. Highly anomalous frequency dependent correlation levels induce an unimpressive envelopment effect of the sL (LS) and sR (RS) surround signals. For monitoring this, the Surround Sound Analyzer features an own correlation meter for the sL (LS) and sR (RS) surround channels.